Prepare our quick and delicious Four Lettuce Salad with Tomatoes and Avocado as a satisfying lunch or a crisp and refreshing starter. Sometimes we’re craving something light and refreshing. When that’s the case, this Four Lettuce Salad with Tomatoes and Avocado is the perfect dish to satisfy our hunger. Filled with nutritious veggies like silky avocado, juicy tomatoes and a blend of lettuces that range from sweet to peppery, it is topped with a subtle dressing that perfectly complements this salad. Serve this with nearly any meal as a healthy starter or side, or eat a bigger portion for a meal unto itself. 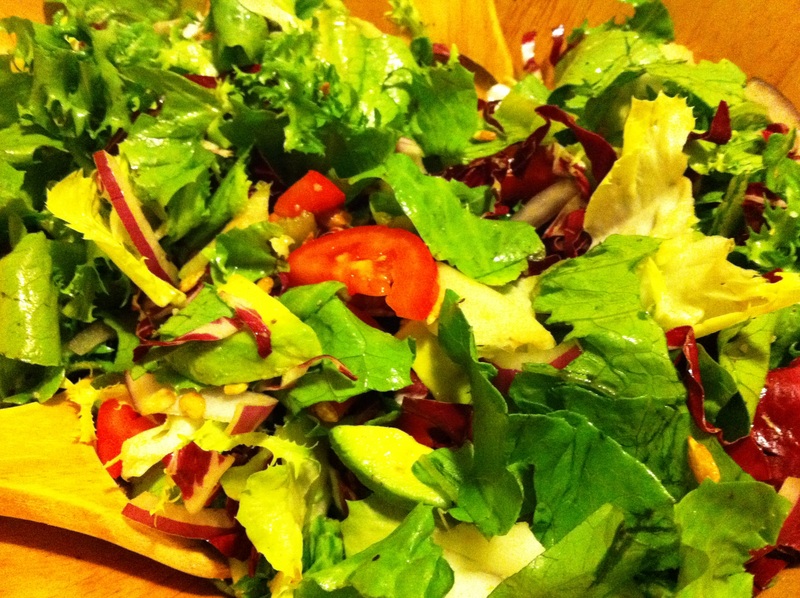 Toss romaine, escarole, radicchio, endive, tomatoes, avocado, onion and sunflower seeds in a large salad bowl. Drizzle vinegar and oil over greens and season with salt and pepper. Toss thoroughly and serve. TIPS: Serve with your favorite soup and crusty bread for a delicious lunch. The sunflower seeds can be replaced with chopped walnuts or sliced almonds if preferred.